Meh, they aren't shorter so I could care less. I was interested more for a coilover conversion purpose. HDs are not the stock MR Bilsteins. From what I have read the HDs have firmer damping. FYI - Ohlins also makes a damper for use with stock style springs, i.e., not coilovers. I think they can do whatever valving you want. A set is a bit spendy though - last I checked a few years ago, it was around $1800. What is Bilsteins part #'s for the stock Evo Bilsteins then? Are these the Ohlins you are referring to? The HDs are different in appearance, and I have read that they have different damping characteristics, so I wouldn't call them the factory MR struts/shocks. 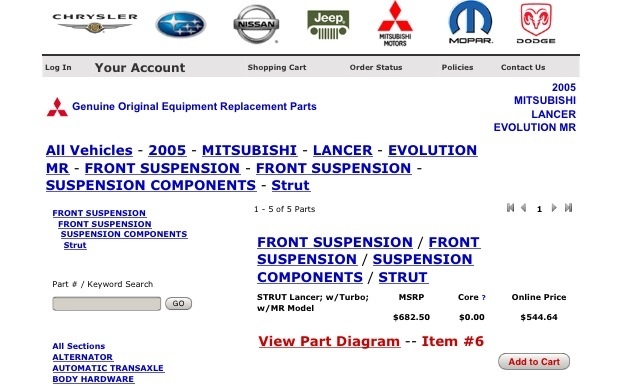 I doubt Bilstein sells the factory MR struts/shocks directly, so not surprising that you can't find a Bilstein PN. Those are the Ohlins, but they can be had without the Works Ride springs from places like GTWorx. Last edited by mrfred; Jun 27, 2013 at 12:54 PM. Just to add, the MR Bilstiens are indeed different from the HD's. How come no one seems to sell the direct OE Bilstein replacement shocks/struts if indeed the HD's are not what they came with? Every Evo Bilstein search I have done returns the HD's as the replacements. 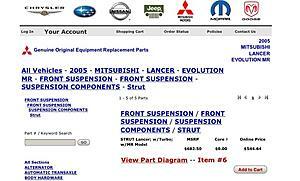 Do you have to buy the OE Bilsteins for the MR through Mitsubishi? Exactly. And with a $682 per (front) MSRP price tag, its no wonder you don't see them for sale new, you'd have to be retarded to spend that on a single MR strut when you can get the HD's for a fraction of the price. These are the part numbers for the MR OEM Bilstein. Part # Front: MN101890 / Rear: MN101899. So I guess a better question than the one originally posed would be, "how to the OEM MR Bilsteins, B6-HD's, and B8-SP's all compare to each other?" I was under the impression that the HD's were what came on the MR's, but seeing as how that is incorrect, how do the stock compare to HD? Bilstein MRs are only available from Mitsubishi....and ridiculously expensive. Bilstein HDs are available from numerous sources (including us). Very slight appearance differences compared to MR, very close in valving but not exactly the same. A hair firmer IIRC but my shock dyno plot for both was on my laptop that was stolen 4 years ago when we were developing our GTWORX springs. Bilstein Sports....well I have no idea . Definitely new to me. I'll do some digging, might be able to get a shock dyno plot for you guys but no promises. I'll see what I can do. Yeah, I would be interested in seeing how they compare as I will be purchasing Evo shocks/struts for my 91 GSX and I am needing to decide between the B6 and the B8's. I am pretty set on pulling the trigger on some B8's next week. Any suggestions on springs? I have been reading on here and come to the conclusion that the prokits give the best drop and DD use.